These bars look as impressive as they taste, but they are deceptively easy to prepare. 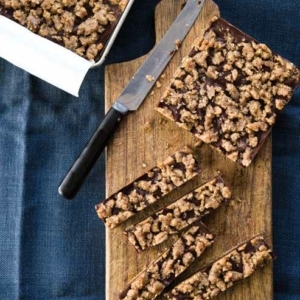 Featuring buttery pecans and fiber-rich dates, these bars are loaded with minerals, including magnesium, manganese, copper, and iron, and are teamed up with a homemade chocolate layer that’s bursting with antioxidants. Because they are a raw, no-bake dessert, be sure to serve these bars directly from the refrigerator or freezer for best texture. Line a 9-inch square baking dish with parchment paper and set aside. Prepare the crust and topping: Place the pecans in a food processor fitted with an “S” blade and process until they are ground into a meal. Add in the dates, coconut oil, and salt and process again until the dough sticks together when pressed between your fingers. Reserve ı cup of this mixture for the crumble topping and press the rest of the dough evenly into the lined baking dish, then set aside. Sprinkle the remaining ı cup of crumble over the top of the chocolate layer and use your hands to gently press the topping into the chocolate filling. Place in the freezer to set for at least 2 hours and then cut into bars and serve chilled. Reprinted with permission from Everyday Detox, by Megan Gilmore, copyright © 2015, published by Ten Speed Press, an imprint of Penguin Random House LLC. Photographs copyright © 2015 by Nicole Franzen.